It all started with public community meetings; countless General Meetings with most households present from the entire community to discuss the needs of their children. 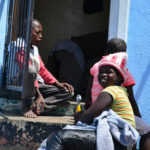 Eventually, each QQ Section household pitched in five Rand to build a Community Creche (a daycare and pre-school) and to install the first toilet in the entire settlement. In QQ section, when there is a problem, people discuss it and come up with a solution together. When supplies and staff were needed for the pre-school, parents were asked to donate items they don’t use, and volunteer their time. When winter came and the pre-school leaked when it rained, a community member offered to fix it for free, and the older kids from the youth group painted the school in bright, beautiful colors. 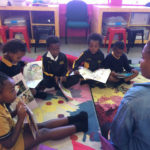 The elected Children’s Committee holds meetings every week about the school and other children’s projects in the community. But in order to make a decision, they always have to go back to the wider community. In QQ Section, the community believes that it takes the participation of each and every one of them to raise a child. lost everything they owned. With the help of an emergency grant from CHOSA, the community mobilized and came together to rebuild all 71 structures. CHOSA is committed to supporting the right of communities to control their own development.